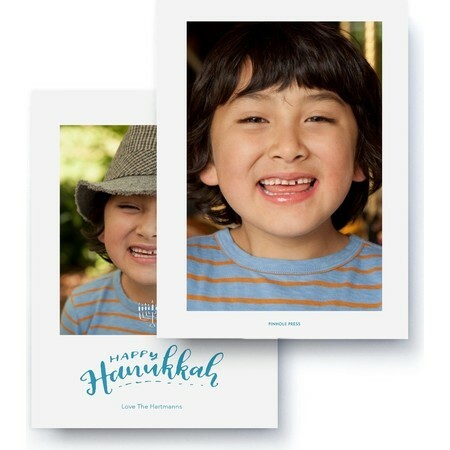 This year, make your photo the main attraction with a Happy Hanukkah greeting photo card. Beautifully designed by acclaimed artist Rachel Joy, the only thing missing is your personal touch. 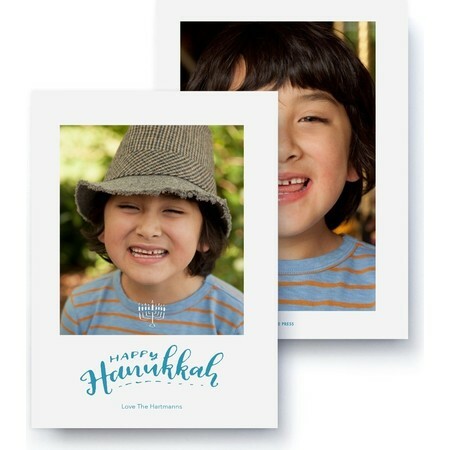 This custom Happy Hanukkah greetings card displays two separate photos as well as options to personalize the text. It's easy to create your custom Hanukkah greetings with our online card designer. Simply drag your photos to the page, type your sentiment and choose the text color for a one-of-a-kind Hanukkah greeting that's sure to find its way into your loved one’s heart. What better time to let your loved ones know you're thinking of them than Hanukkah? A custom Happy Hanukkah Greetings card is a caring sentiment that truly confirms loving bonds between family and friends. A Hanukkah greeting is also a great way to reconnect with dear friends you've lost touch with over time. Photo cards are 5.125 inches by 7 inches and printed on ultra white premium paper. Superfine ultra white, eggshell finish A7 envelopes are included with your purchase.